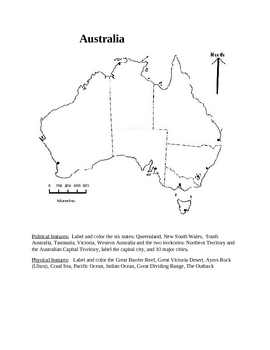 This is an informational "Atlas" page over Australia. It is intended for students to use the Internet on the CIA world fact book. There are four pages of research activities to complete. The first two pages are over statistics such as population, literacy rate, life expectancy, ethnic groups, religions, etc. 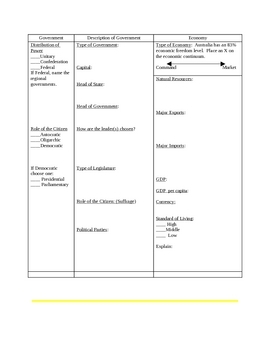 The second page has to do with information about the government and economy of Australia. The third page asks student to do more synthesizing of information. They are asked to explain how the history has influenced the culture and to give specific examples. Also, they are asked to describe the economy of Australia, and give specific examples of investments in human capital and capital goods. 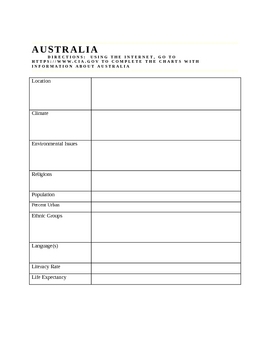 Then on the fourth page there is a map activity, where they are to label the state, territories, cities, and also the geographical features of Australia. The students really enjoy completing these activities. I tell them that our books are out of date and that we are going to use the CIA site to find out the most up to date information (as if we are govt. agents). I'm sure your students will enjoy this as well. Let me know if you have any questions.